We have something to celebrate, because from now on you will see the new, improved platform when you log in! At New Green Market, we are continually working to improve our platform. 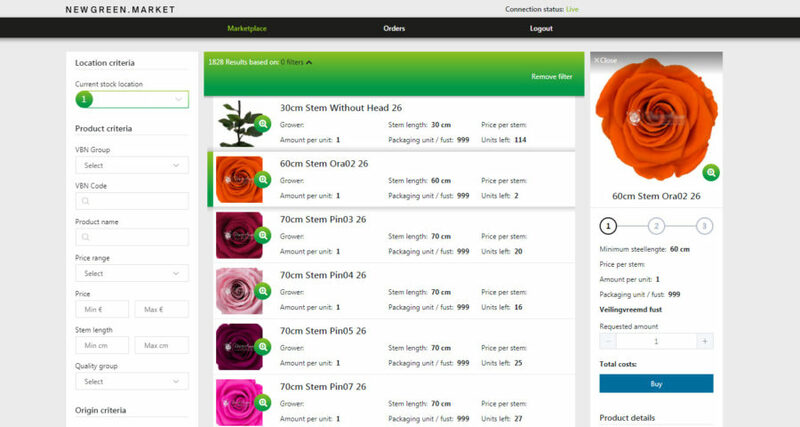 We do this to make it even easier and more accessible for everyone to trade in flowers, plants and floristry products. We are pleased to introduce to you the updated look and feel and improved functions. make decisions even more quickly and easily. The products on offer come directly from the system of the grower or seller. The range displayed is therefore always available! The sale will be concluded directly at the source, enabling maximum freshness and sustainability. Trading on NGM can take place at any time. With a growing number of new suppliers and product variation, the range is changing continuously. In order to prevent you from missing anything, we will clearly specify on the platform which products are new and which batches are sold out. Recently implemented changes to the product range will temporarily be given a different colour. The logistic handling of orders is also an important focal point and something New Green Market wants to start coordinating in the near future. Orders can then easily be delivered according to the desired delivery criteria. The first orders in the test phase have already been delivered successfully. In this way it will be increasingly easy to search, trade and transport in the coming time. If you would like to see our new release and put it into use, please contact our team.